Why My Weebly Site not Loading but Weebly Website is Loading? Well, as the proverb goes – “No Free Lunch” – there is no such free thing in the world like the free hosting provided by most of the free website builder tools like Weebly, Yola or Wix. Here we explain the problem with Weebly an example but this is applicable for all shared hosting providers. If you suddenly noticed that you are able to edit your site by opening Weebly.com but your own Weebly site (subdomain or your own domain hosted on Weebly) is no more accessible then this is what the reason could be. Weebly has separate dedicated servers to run its own site Weebly.com and other free hosted sites as shown in the picture below. Open any reverse IP lookup sites like yougetsignal.com to find out all site details hosted in the same server of your site. Enter your site URL and click on check button to get the list of sites as shown in the below picture. You can see a warning message saying some of the highlighted sites in red color may have an explicit content and due to this all hosted sites on this server probably will be blocked by your Internet Service Provider (ISP). Though Weebly delete those explicit sites periodically it is not possible for them to stop someone creating such a site. Hence, it is always a risk with free hosting that your site will be blocked or unblocked at any point of time without even you noticed. How to Unblock Your Weebly Site? Now that you know why your site is being blocked and follow one of the below way to unblock your site. Login to your Weebly account and raise a support ticket mentioning the issue in details and inform them to either delete the explicit sites on the server or get another shared server’s IP address (Server 3 in the above example). With millions of sites to maintain you may not get a response from Weebly support in most of the cases, especially if you are a free user. 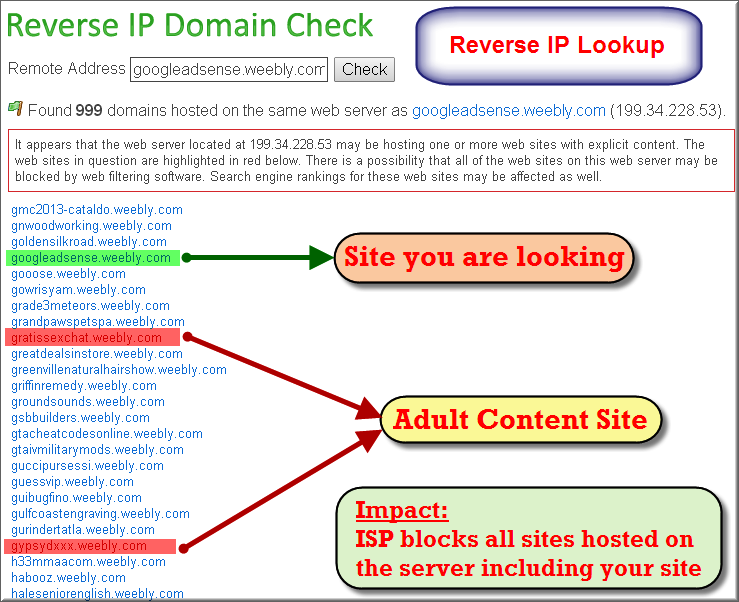 Check for a random Weebly sites and find out the IP address of the shared server using IP lookup tool available in the net. Configure this new IP address to point your domain name in DNS record settings. You can also formally launch a spam complaint with Weebly in order to delete the abusive sites hosted on the shared server. 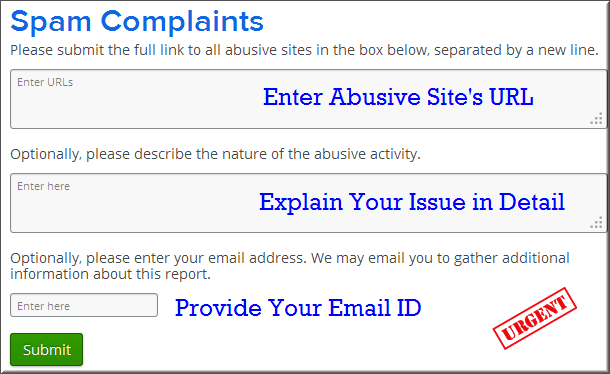 Click here to go to Weebly’s spam complaint page. Enter all the abusive URLs one per line which you found using reverse IP lookup. Provide the description of the issue in detail along with your email id for further contact. Ensure your site does not have an explicit content and not deleted by Weebly. Contact your ISP and confirm the reason why your site is being blocked. Check your site or Weebly itself is blocked by the country, especially when you are checking it first time in a new country. Use VPN or reliable proxy servers to access your site. I need a verification code.